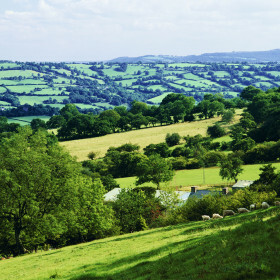 Deep in rural Herefordshire, you can almost hear the silence. 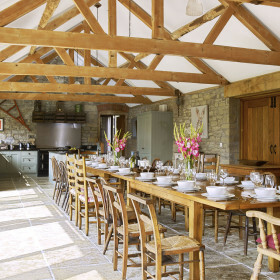 The Old Mill and Hayloft, unfussy, uncluttered and unimaginably beautiful, fills it with the sound of happy chatter and laughter. 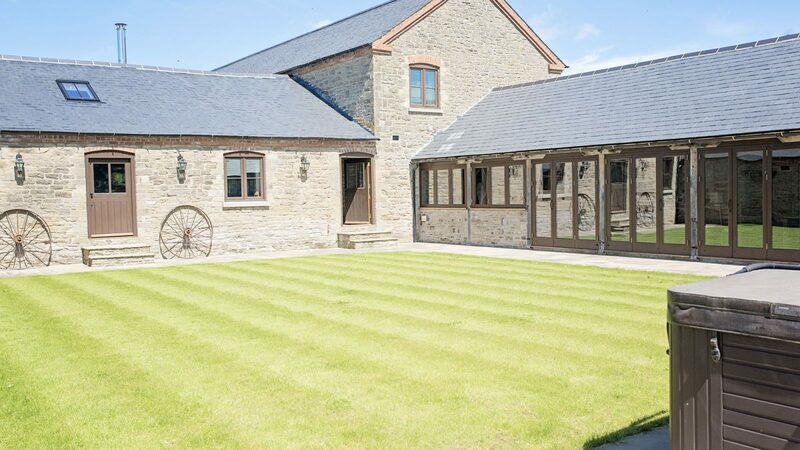 With its flagstone floors, beams, Aga kitchen and private walled garden, this is the perfect retreat from an ever-busier world. 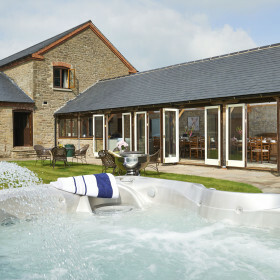 The silence is captivating; from the hot tub, you can hear the rustle of the grasses in the fields. The luxury is simplicity itself: unfussy, uncluttered, and unimaginably beautiful and tactile. The space is cavernous. 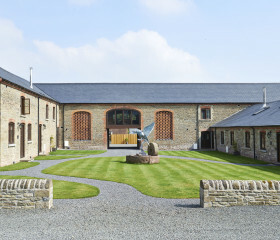 The Old Mill and The Hayloft in deepest Herefordshire offer well over 5000 square feet for 18 or more of your nearest and dearest to refresh, renew, relax and reacquaint. This is where you’ll take pleasure in simple, timeless things, although a wifi and a cinema room are a pleasant nod to 20th-century living. With your bedroom window ajar, you’ll wake to the sound of birdsong. 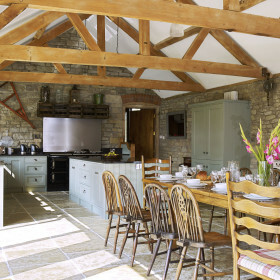 Coffee is on the go, so fling back the goosedown duvet and pad across flagstone floors to the enormous kitchen/diner. 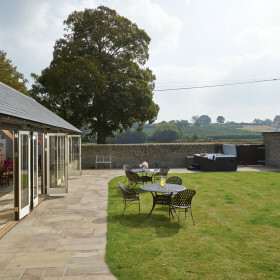 Take it on the terrace in the private walled garden. The skies above are as big as your plans for the day. 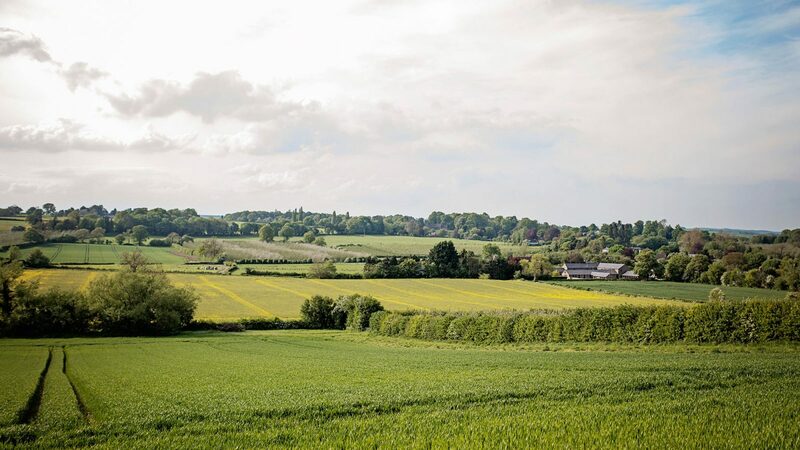 Explore the rolling hills of England’s best-kept secret, then return to the fruits of the land: the best beef and root veg rippling with flavour, all washed down with summer cider. Prepare it all on your very own Aga, or let us step in, while you step down, put your feet up and demolish a local vintage. Life here is slow and easy. It’s a place to drift and dream. 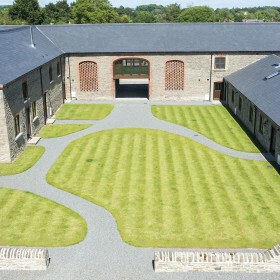 When the sun breaks out, you’ll glide effortlessly from the kitchen sitting area to the private walled garden – an almost monastic lawned and terraced courtyard – to make big plans over long drinks. At mealtimes, the sizzle of steaks on the barbecue breaks the silence. 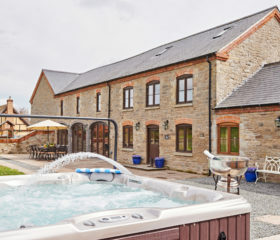 For dessert, maybe some bubbly and some bubbles in the hot tub, with its soundtrack of swishing grasses and vista of rolling hills. To live at The Old Mill is to love it. Life here is a world of tactile textiles. 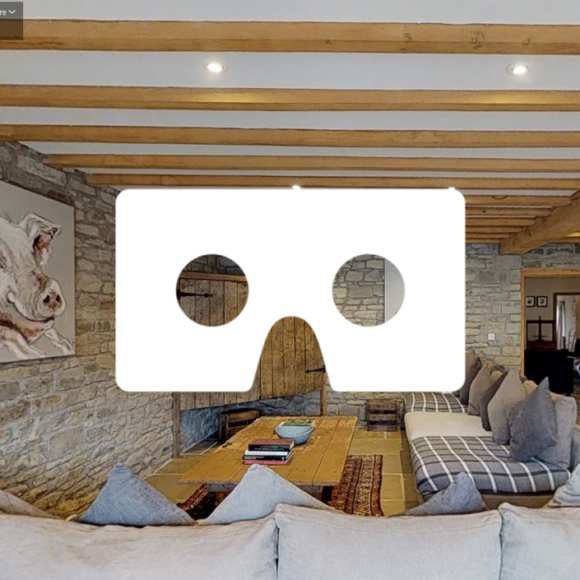 Amid the vast spaces, you’ll pad barefoot over the flagstone floors and oak boards. 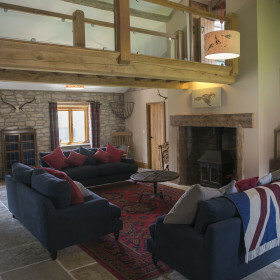 The squishy sofas invite a good read, and the beams and exposed-stone walls add an authentic elegance. The heart of this home is the open-plan kitchen/diner. 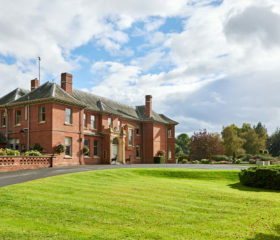 Its space, oak tables, seating area and rural ambience suggest holiday jaunts broken at a wayside tearoom for scones and coffee. If you love Agas, you might want to cook up a saga yourself. 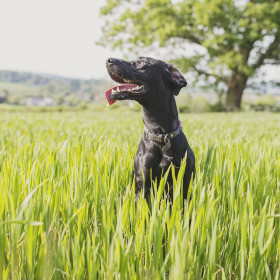 Alternatively, just whisper it and our chef will come running, armed with the fruits of this lush landscape: pure beef, chicken, fresh asparagus and maybe a draft of cider. Put your feet up and raise a glass to fresh air and freedom. 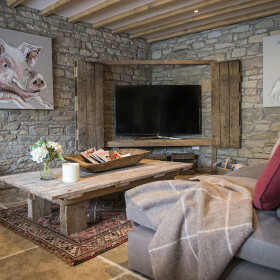 After dinner, there’s fun to be had in the Hayloft’s games room, a loaded iPad for the wifi, and movies to catch in the cinema room. 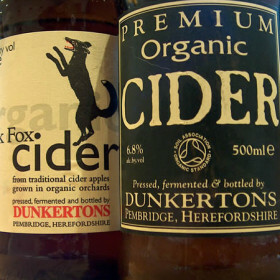 Wrap up the day beside the woodburner, with cracking conversation and crackling logs. 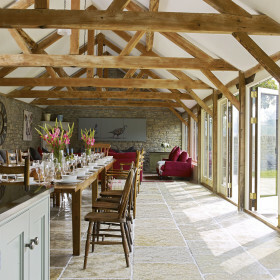 The open-plan country kitchen/diner is perfect for chopping and chatting. 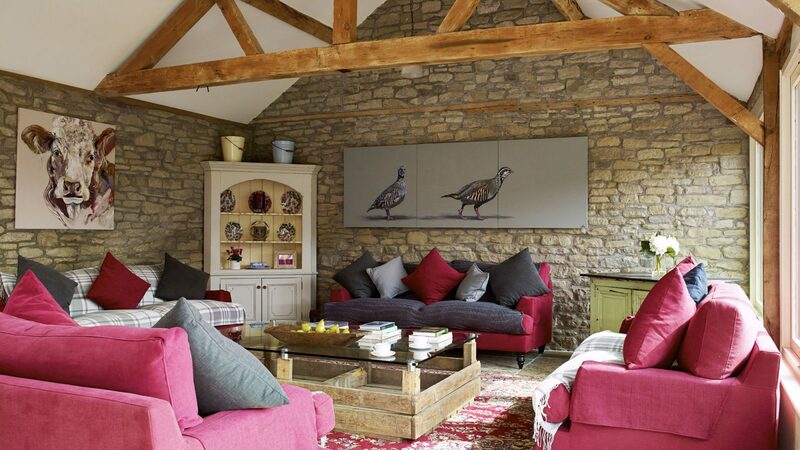 Beneath the oak beams sit the homely charms of flagstone floors and exposed-stone walls. 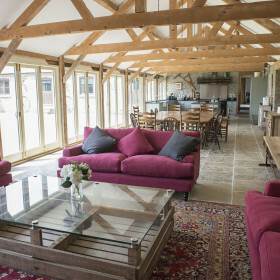 A seating area with TV awaits drinks and nibbles; chat and laughter. 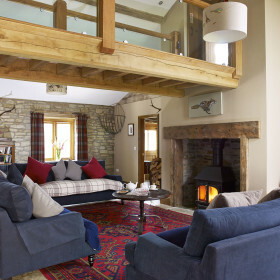 The warm ambience created by family and friends hangs in the air here, but it’s kick-started by the heat from the Aga. 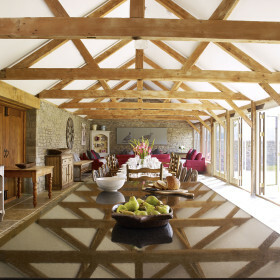 This is a sumptuous space, with room for all and light flooding in from the wall of windows that gaze upon the private walled garden. 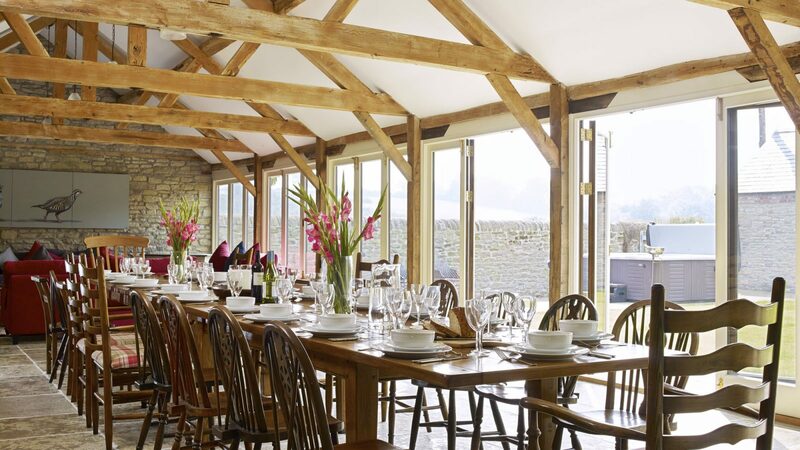 Throw open the French doors, let the sunlight flood in and pile the tables high with steak and salad, fresh root veg and saucy cider. 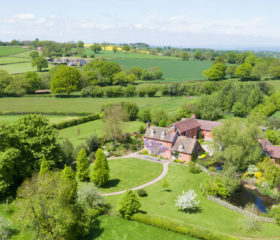 There’s plenty to do, see, eat and drink in rural Herefordshire, but we’ll forgive you for wanting to put the day into fast-forward so you can simply hit the sack. 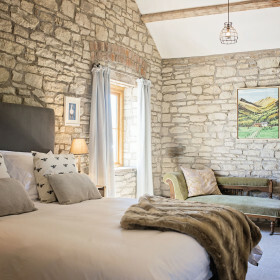 In beamed bedrooms, enclosed by exposed-stone walls, bare feet will wander over flagged floors or deep carpets to sleep in pocket-sprung beds layered in soft cotton. 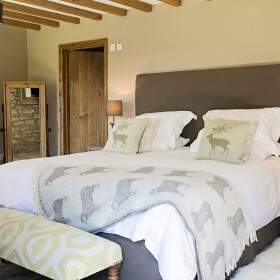 Leave the window a little ajar, let in the pure rural air and you’ll invite deep sleep and vivid dreams. Let the battle for the bedrooms begin. 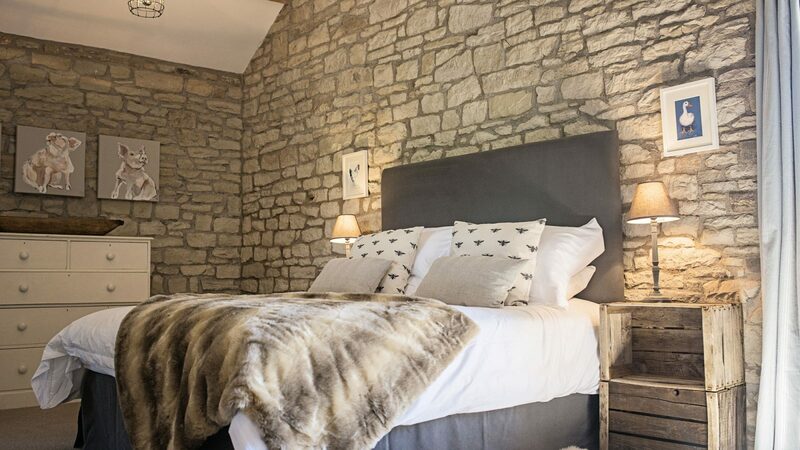 Choose from four ensuite rooms at The Old Mill, every one with character etched deeply into the stonework, flags and quirky furnishings. 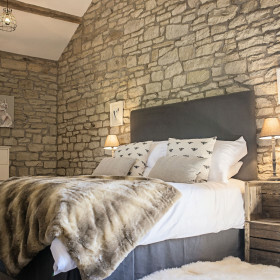 Sleeping ten, The Old Mill offers three King Size rooms and one with three singles and an option for a Z-bed. 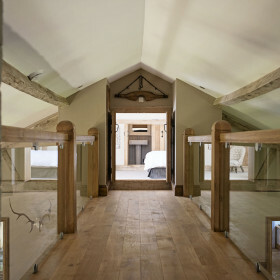 In the adjoining Hayloft, four equally delightful ensuite King size bedrooms await. No squabbling, now. 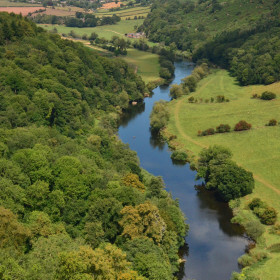 Walk the Malvern Hills, ride the rapids and climb the rock faces. Visit ancient courts and castles. Taste the beefiest beef and the freshest fresh veg. 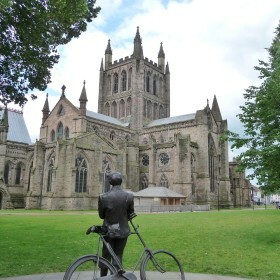 There’s culture to burn with poetry in Ledbury and folk in Bromyard. 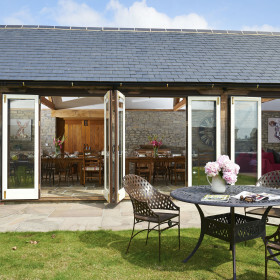 Sample Michelin dining at The Stagg Inn and shop till you drop at Hereford’s Old Market.